While climatologists are carefully watching carbon dioxide levels in the atmosphere, another group of scientists is exploring a massive storehouse of carbon that has the potential to significantly affect the climate change picture. 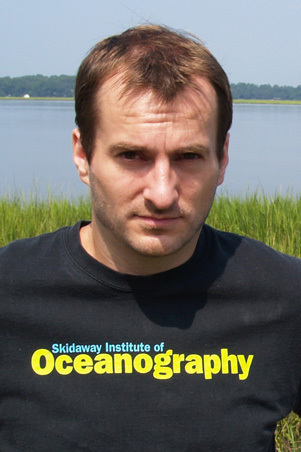 University of Georgia Skidaway Institute of Oceanography researcher Aron Stubbins is part of a team investigating how ancient carbon, locked away in Arctic permafrost for thousands of years, is now being transformed into carbon dioxide and released into the atmosphere. The results of the study were published in Geophysical Research Letters. The Arctic contains a massive amount of carbon in the form of frozen soil—the remnants of plants and animals that died more than 20,000 years ago. Because this organic material was permanently frozen year-round, it did not undergo decomposition by bacteria the way organic material does in a warmer climate. Just like food in a home freezer, it has been locked away from the bacteria that would otherwise cause it to decay and be converted to carbon dioxide. Stubbins and his colleagues conducted their fieldwork at Duvanni Yar in Siberia. There, the Kolyma River carves into a bank of permafrost, exposing the frozen organic material. This worked well for the scientists, as they were able to find streams that consisted of 100 percent thawed permafrost. The researchers measured the carbon concentration, how old the carbon was and what forms of carbon were present in the water. They bottled it with a sample of the local microbes. After two weeks, they measured the changes in the carbon concentration and composition and the amount of carbon dioxide that had been produced. 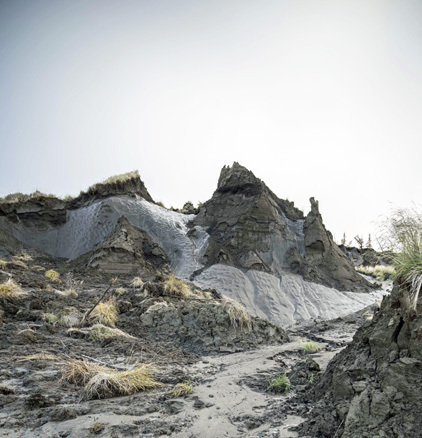 A bank of permafrost thaws near the Kolyma River in Siberia. The study also confirmed what the scientists had suspected: The carbon being used by the bacteria is at least 20,000 years old. This is significant because it means that carbon has not been a part of the global carbon cycle in the recent past. “If you cut down a tree and burn it, you are simply returning the carbon in that tree to the atmosphere where the tree originally got it,” Stubbins said. “However, this is carbon that has been locked away in a deep-freeze storage for a long time. The carbon release has the potential to create what scientists call a positive feedback loop. This means as more carbon is released into the atmosphere, it would amplify climate warming. That, in turn, would cause more permafrost to thaw and release more carbon, causing the cycle to continue. “Currently, this is not a process that shows up in future (Intergovernmental Panel on Climate Change) climate projections; in fact, permafrost is not even accounted for,” Spencer said. “Moving forward, we need to find out how consistent our findings are and to work with a broader range of scientists to better predict how fast this process will happen,” Stubbins said. In addition to Stubbins and Spencer, the research team included Paul Mann from Northumbria University, United Kingdom; Thorsten Dittmar from the University of Oldenburg, Germany; Timothy Eglinton and Cameron McIntyre from the Geological Institute, Zurich, Switzerland; Max Holmes from Woods Hole Research Center; and Nikita Zimov from the Far-Eastern Branch of the Russian Academy of Science. We woke up a little late this morning after yesterday’s late night. Victoria and I met to go over plans for the day and to discuss the details of the experiment that we plan to start today. The experiment is a component of SSU graduate student Zac Tait’s thesis project. Zac couldn’t come this time because he is about to be a father. His daughter, who they will name Iris, is due on 4 February. Zac left me and Victoria with extensive notes and prepared all the supplies but we’ll run it. The goal of this experiment, as in previous ones, is to test the hypothesis that Arctic Ocean bacteria can utilize the carbon locked up in the humic material that makes up the permafrost, but doing so will require them to acquire more nitrogen. The most abundant source of nitrogen in the water is found in the mineral form of nitrate (NO3). One of the major questions of our project is whether the release of the carbon stored in the permafrost will set-up increased competition for NO3 between the photosynthesizing autotrophs (phytoplankton) and the CO2 respiring heterotrophs (bacteria). The idea is that the more organic carbon that gets released into the ocean the more bacteria activity will occur. However, that increase in activity will be at the expense of nitrate resources that the phytoplankton need in the spring (when the lights come back on) to grow. If there is less nitrate available there will be less phytoplankton and therefore less fish, seals, whales etc that depend on a food web whose base is the phyotoplankton. So it’s somewhat of a counterintuitive idea; add more nutrients and get less out. In previous experiments we found generally that this hypothesis is true, but that the carbon-rich humic material we collected directly from the tundra is used very slowly which makes the question hard to address given the practical constraints of our time here. Because our time is short and the temperatures are cold which slows everything down, we decided on a new twist for these experiments. This time, we are using humic material that has already been broken down some by exposure to sunlight. This process is called photo degradation. Photo degrading complex carbon molecules occurs naturally (It’s reasonable to expect that humics derived from melting permafrost will be exposed to sunlight on their trip to the ocean.) and it increases its availability to bacteria as a nutrient source. So, prior to the trip Zac exposed humics in a solar simulator for 0, 5 and 15 days resulting in increasingly degraded humic materials. Amazingly, after 15 days of simulated exposure to sunlight the brown humic material was almost completely colorless. The carbon is still there but since it has been broken into smaller and less condensed molecules it doesn’t absorb as much light, thus it appears lighter in color. Our experimental design is relatively simple. We use 4 liter (1 gal) milk jugs (actually they are a special nontoxic plastic but they look like milk jugs) to incubate bacteria with the humics and allow them to grow. Over the course of the week we’ll be here we take samples to watch the bacteria grow track the dynamics of the carbon and nitrogen. Our hypothesis will be supported if we see the bacteria grow and the carbon disappear in coordination with the disappearance of the NO3. After 9 hours of filtering and rinsing we finally got the experiment set-up and running. We’ll sample it daily (or every other day) for the time we’re up here. But the real excitement happened on the ice today. Because we are so concerned about the stability of the ice the UMIAQ crew went out to check our ice camp which we had left standing. When they got out there they realized that the ice was moving a lot and that large cracks were beginning to appear. The crew was scared enough that they just came back leaving the tent behind. But Brower thought they could get it and made a heroic trip back out with Tony and Glenn. They ripped the tents out of the ice leaving the stakes behind, quickly lashed it on two sleds, and hightailed it back jumping cracks with open water. We heard some of it on the radio. The whole situation has us pretty nervous and thinking very carefully about safety. Brower and Glenn standing by the rescued tents. Either way tomorrow we won’t go out. We’ll re-group and re-evaluate. Ice conditions are still unstable. Our UMIAQ support team spent the morning doing reconnaissance of our intended sampling sites. After yesterday’s efforts they suggested that since it might be dangerous, it wasn’t a good idea for anyone on the science team to accompany them. Because the ice is still forming and the ocean is a powerful force, the ice can break-up pretty quickly. The team first scouted out our near shore site, but it was inaccessible due to a major crack between it and our ice trail. We use a trail cut through the ice to guide us on a safe snow machine run over it. They continued on to our second site located further out into the ocean and to the north. The ice in that area seems to be more stable. They liked what they saw and decided that it would be safe for us to set up camp there. 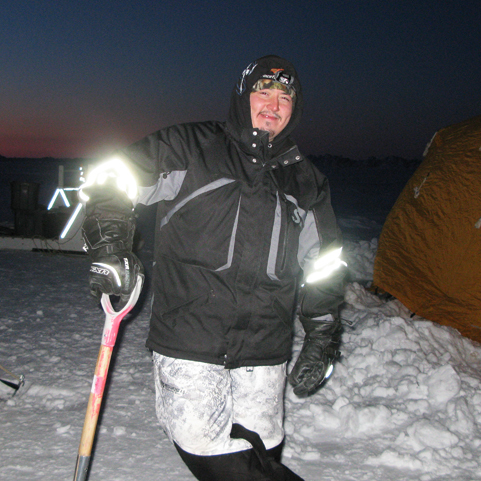 Brower Frantz, UMIAQ logistics leader proudly stands by the ice camp. After making this decision the team came back, loaded up the camp gear (tents, generators, heaters, ice augers, etc) and went back out. This time Steven Baer from the Bronk group went with them to help orient the tents and make some basic measurements. Before starting we need to know the ice thickness, water depth, and usually how far light penetrates. In this case there basically isn’t any light but hey, we’re scientists. Measuring zero’s (or close to zero) can be just as important. Its data! 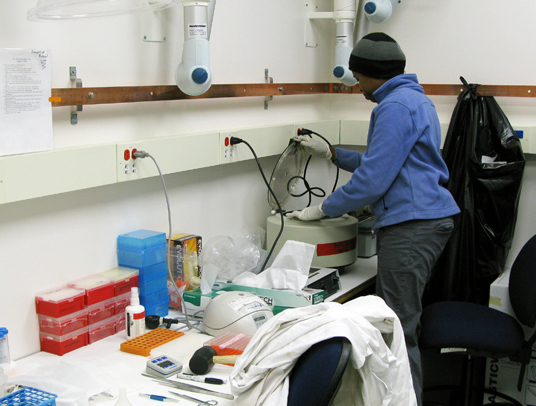 Meanwhile, back on the NARL campus where our labs are, there was a flurry of activity as we all checked and prepped our gear. Finally, around 3pm the camp was set-up and we were ready to go. I was pretty worried about how late it was getting, but because we have such a short time up here and the ice was deemed safe now we needed to push a little bit. Who knows if we’ll even get another chance given the dynamic condition of the ice. The ride out was relatively uneventful. The ice was remarkably smooth compared to our previous trips. As was explained to me, when the ice first forms it is relatively flat and it only gets jumbled up later as storms, wind, currents, and tides push it around. Flat ice generally means that it is new ice. That is what was worrying everybody. We know the ice is still forming and moving a lot. Hopefully it won’t move while we’re on it! After about 30 min of driving we made it to our camp. Having well established sampling routines by now, this is our 6th expedition, we all got to work unloading our gear and starting to sample. The Yager group occupies their own tent (the smaller one) while the Frischer and Bronk group occupy the larger one. In the Frischer tent I got started right away making measurements of the water column. We are using a new instrument that lets us measure depth, temperature, salinity, oxygen, chlorophyll, pH, and turbidity. It’s a pretty nice instrument but a bit delicate and the computer software is not straightforward. We transported it as if it was a delicate infant wrapped in blankets with warm water bottles and hand warmers to make sure it didn’t freeze on the way out. I think we overdid it! When I unwrapped it in the tent it was positively hot. The instrument worked well and we got a good look at the water conditions. 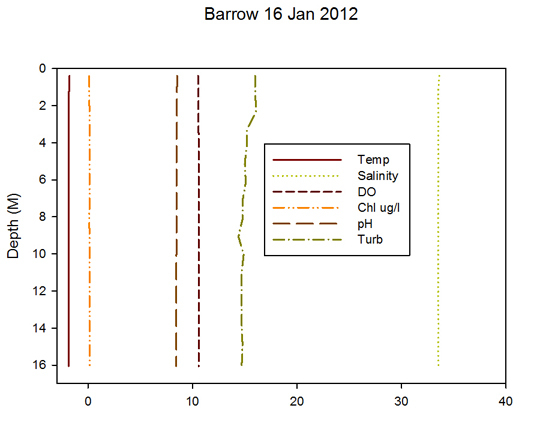 As expected the water temperatures was -1.8 deg C, salinity was around 33 PSU (normal for the Arctic coastal ocean), there was almost no chlorophyll in the water (no light no algae in the water). Most importantly the water column was well mixed which means that we could sample at one depth and be reasonably assured that it would be representative of the whole water column. We decided to sample at 2 meters below the bottom of the ice. After I was finished measuring the water the Bronk group got rolling. They rinse and fill what seem like a million small bottles to which they add a very small amount of nutrients enriched in their stable isotope concentrations. Stable isotopes are non-radioactive form of elements (atoms) that are slightly heavier than the normal form. For example, the normal atomic weight of Carbon is 12 (meaning it has 12 protons) while the stable isotopic form has a weight of 13. We refer to it as 13C. Because 13C is slightly heavier than 12C, it can be measured on a mass spectrometer. 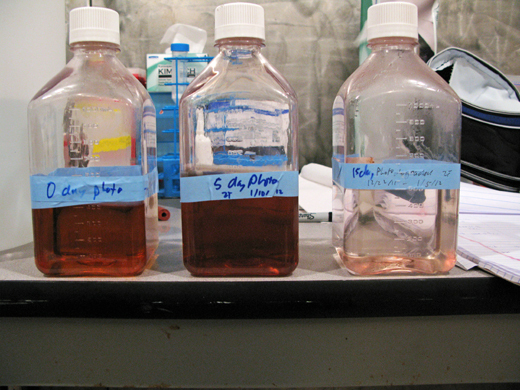 By measuring how much of it goes into cells during an incubation, the rate of uptake can be calculated. The Bronk group is making some of the first ever measurements of nutrient uptake rates by microbes in this region of the Arctic coastal ocean. 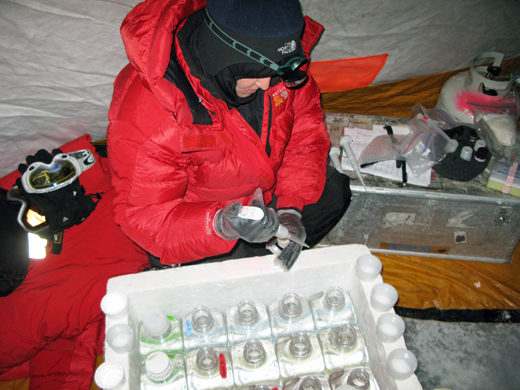 The process went pretty smoothly but since it was so cold, even in the tent, the pipettes which they were using to inject the stable isotope into the samples were freezing and slowing the process. Dr. Debbie Bronk injects stable isotope labeled nutrients into seawater. Meanwhile in the other tent the Yager group were having even more problems with freezing. 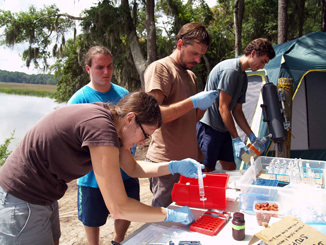 They are collecting water samples to make measurements of the carbon chemistry and general activity of the microbes, so it is especially important that their samples do not freeze and are not exposed to the atmosphere which can contaminate the dissolved gas content of the seawater. Unfortunately, their samples were freezing. 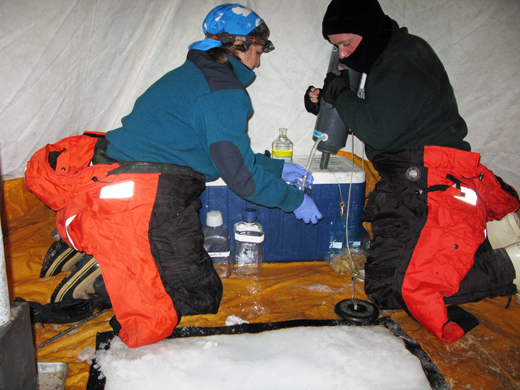 However, after getting them off the ice floor of the tent and placing them into a seawater bath (a cooler filled with seawater) they seem to have solved the problem and were able to collect most of the samples they needed. Dr Tish Yager and Colin Willams collecting water. When the Bronk group was finished it was our turn. Our sampling is probably the most straightforward, but we need to collect a lot of water. We’re collecting enough water so that we can extract DNA and RNA from the bacteria in it. 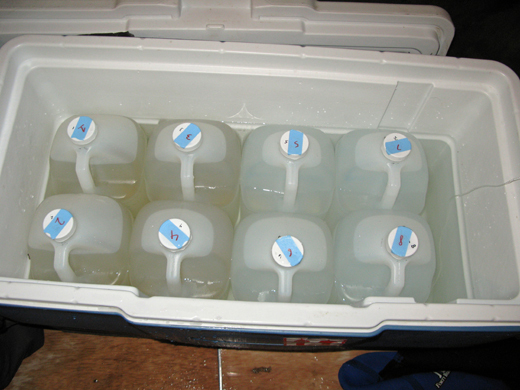 We collect about 140 liters (about 40 gal or 310 lbs). Using a specially designed submersible pump we collected water in seven 20 liter carboys wrapped in neoprene and then place them in a cooler of snow. Believe it or not, the snow actually keeps the water from freezing. But, as simple as it sounds, we had our problems too. The generator that was running our pump ran out of gas. Actually, the generator had a gas leak so it’s lucky it just ran out of gas and didn’t explode. 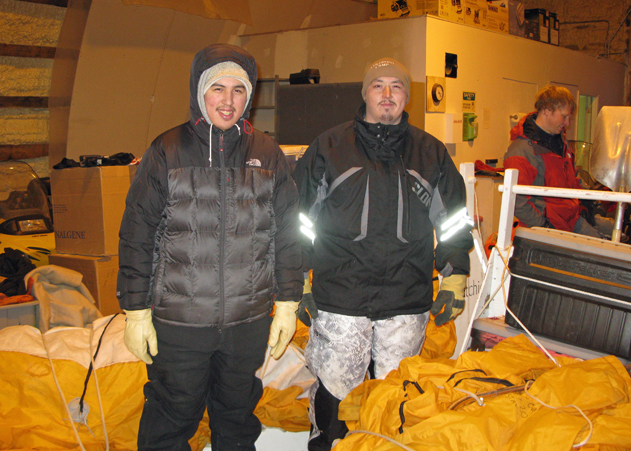 But, because of excellent planning on the part of the UMIAQ team we had two generators on site. However, that meant the Yager group was without lights in their tent. We solved that problem by moving two snow machines so they pointed at the tent and the headlights provided enough light. Finally we were all done and got all our gear and samples loaded back onto the sleds. It was unbelievably cold and windy and we were all tired and ready to get back. The trip started off smoothly until I managed to get my sled stuck. It’s really tricky pulling a very heavily loaded sled. I had to slow down over a series of small ridges because the person in front of me slowed, and that was all it took for the snow machine to sink a little too much into some soft snow and lose traction. With all of us helping we disconnected the sled and managed to lift the back end of the snow machine out of snow, enough to get it moving. Then we were able to push the sled back to some more level ice and reconnect it to the snow machine. It was exhausting! But the fun wasn’t quite over. As we started moving again Debbie, in an effort to make it over the hole I had dug with the snow machine, went a little too fast over the area and bumped into Rachel and Jenna who were on the snow machine in front of them. No real harm though. Jenna fell off the snow machine but it was into soft snow and she wasn’t hurt. The brand new snow machine Deb was driving suffered a cosmetic crack in its fairing. Without further incident we all made it back safely to campus and quickly rushed our samples to our respective labs for processing. Victoria and I spent the next 5 hours in our cold room filtering all that water we had collected. We had hoped to start another humic addition bioassay that is a component of Zac Tait’s thesis research, but it was just too late so we decided we’d do that first thing in the morning. After all the filtering was done, our samples put away safely, and all our gear cleaned-up it was time for some well deserved rest. I felt weary and frozen to the bone but pleased with the progress we had made. Even though the sun won’t shine, tomorrow is a new day. 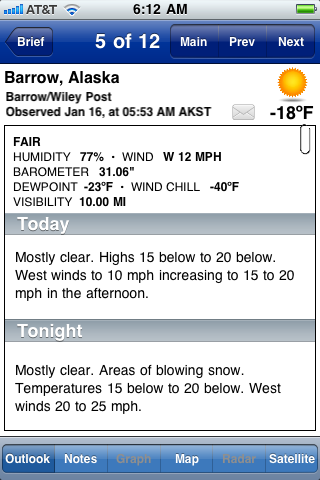 Marc Frischer continues his account of his and Victoria Baylor’s research trip to Barrow, Alaska. Today we again woke up early and began setting up our labs. Actually day and night are surprisingly similar around here. Victoria spent most of the day setting up our molecular lab in the BARC building. It is in this lab that we will extract RNA, DNA, and preserve other samples from the bacteria we collect from the Arctic Ocean. One of the questions we are addressing in this project is whether Arctic bacteria are competing with Arctic phytoplankton for nutrients (specifically nitrogen) and whether when more organic carbon from melting permafrost reaches the Arctic coastal ocean if this competition is intensified. We suspect that an intensified competition between bacteria and phytoplankton (algae) for nitrogen will lead to a less productive Arctic food web in a future warmer Arctic ocean. One way to address this question is to measure how actively bacteria are using the most prevalent form of nitrogen in these waters, nitrate (NO3). By looking for this gene and measuring how active it is, we are learning about how this critical nutrient cycling function is controlled. 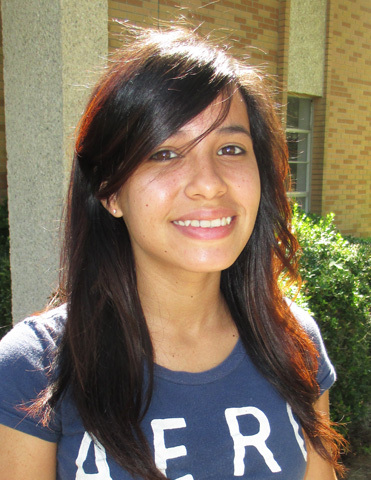 Victoria setting up lab in BARC. While Victoria was setting up the lab I was setting-up the lab (walk in freezer) where we will be filtering water and conducting a bioassay experiment (more on that later). I also spent some time making sure our sampling gear was organized and functional. The pump we use to collect the water from under the ice had seized but luckily with the help of Lance Bennett (part of the CPS team) we got it running. 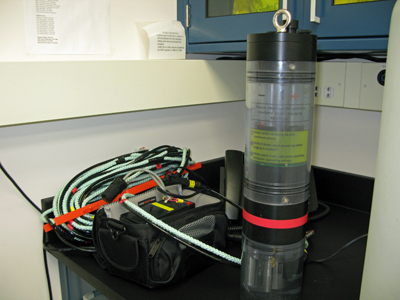 We also brought with us a relatively new instrument to measure water conditions that I am not too familiar with. Initially I couldn’t manage to get the instrument to communicate with its hand held computer, but after a long struggle I finally got it to work. Hopefully I’ll be able to remember everything when we are actually out on the ice. It’s a cool instrument though, it measures water depth, temperature, salinity, pH, turbidity and the concentrations of chlorophyll and dissolved oxygen all in real time. While we were setting-up, our logistics team accompanied by Steven Baer (VIMS) as a representative of the science team was scouting our sampling sites. 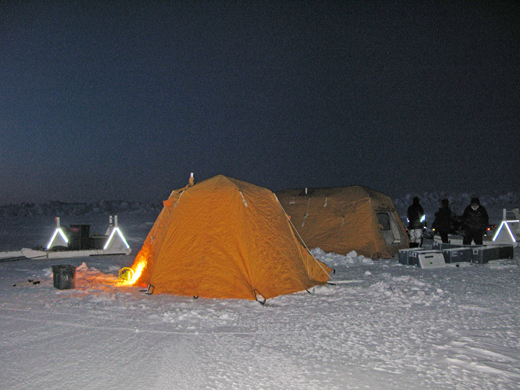 For those of you who may not be familiar with our sampling plans, when the ocean is frozen the way we sample is to set-up a camp on the ice, drill holes, and collect water through them. To safely do this we need to be on well secured and thick ice. This time of year the ice is pretty dynamic as it is still forming and major storms can move it around quite a lot. In advance of our trip this year we had identified several possible sampling locations that were consistent with our science needs, but they need to be checked every day. So this morning the UMIAQ team checked. Unfortunately its seems as our original site developed a major crack in the ice and is moving so we had to switch to a different site a few miles northward where the ice appears to be thicker and is more securely grounded (frozen to land). However, even there the ice seems to be moving a lot. So the camp didn’t get set-up and the plan is to revaluate tomorrow morning. That means we wait, but it’s much better to be safe than to risk everything. If there is one thing I have learned during this project it is to be patient and to trust the support we are getting from our local logistic support team. We’ll just have to see what tomorrow brings. The weather is predicted to be pretty mild.